There are very few pancakes in this world where I won’t say “drown with copious amounts of maple syrup, butter and cream for optimal experience”. This is one of them. 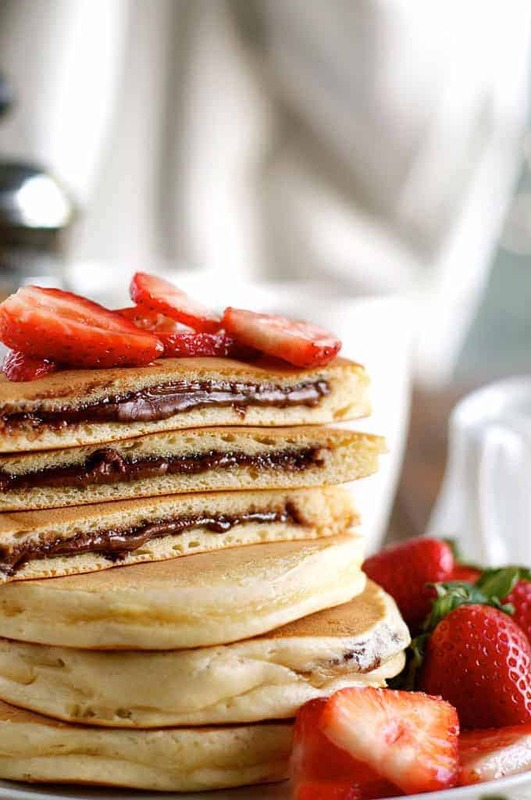 When pillowy soft, fluffy pancakes are stuffed with warm, oozy Nutella, you simply don’t need anything else. I added some strawberries for a pop of colour and freshness. I probably could have added cream. But they are 1000% optional. I’ve seen plenty of Nutella Pancakes “around” on the world-wide-web. But they were all either two pancakes sandwiched together with Nutella, or you had to try to spread Nutella onto the batter in the fry pan (very difficult, I tried!). I don’t usually have a jar of Nutella in my pantry. I can’t. It’s just too dangerous. Because I’m one of those people who will actually sit on the couch and eat Nutella straight out of the jar with a spoon. So Nutella is a treat in my books. Which means if I’m using it to make something, I’ve done something so exceptional that I have deemed that I deserve a treat. Like having a meat free carb free dairy free salad for dinner. (Correction: Couldn’t resist adding parmesan. So it wasn’t dairy free.). Which I did last night. 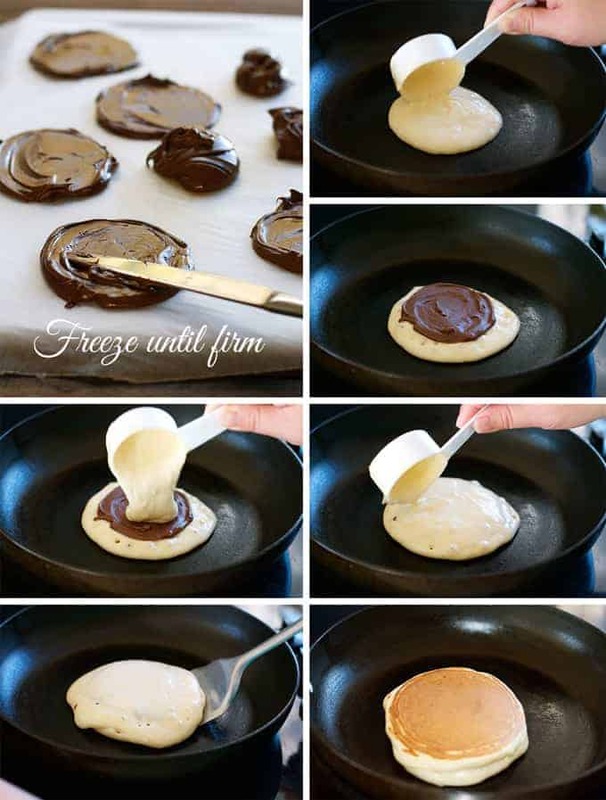 Which means I can have these for Nutella Pancakes breakfast, right? I have plenty of calorie credits from last night to offset this against! Giant Pancakes – to share! 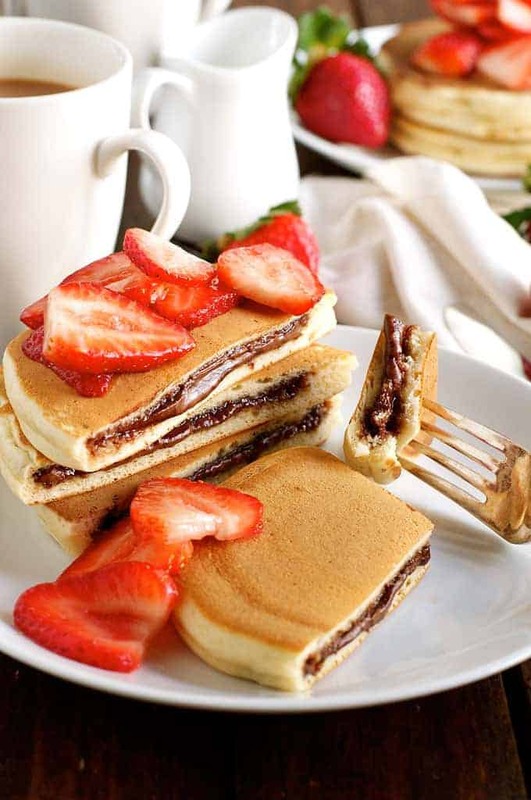 Pancakes stuffed with Nutella! Best eaten warm but still fabulous at room temperature. Great treat for special occasions! Makes 6 to 7 pancakes. Dollop 1 1/2 to 2 tbsp of Nutella onto the baking tray and spread into a disc around 2 1/2" / 6cm in diameter and 1/5" / 1/2 cm thick. (Note 1) Repeat to make 7 discs. Place the tray in the freezer until firm (around 1 to 1 1/2 hours). Dollop 1/4 cup of batter into the fry pan. Working quickly, place 1 Frozen Nutella Disc in the middle of the batter, then top with batter to cover the Nutella disc (Note 4). 4. I use a 1/4 cup measure and fill it about 2/3 of the way up then dollop that on top of the Nutella. You don't need a full 1/4 cup of batter to cover the Nutella, the pancake becomes too big and thick. Use the edge of the cup to spread the batter to cover the Nutella. 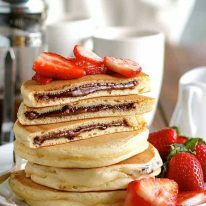 You have to work quickly because once the Nutella disc is on the batter, it melts quickly and it is almost impossible to spread batter on top of melted Nutella. 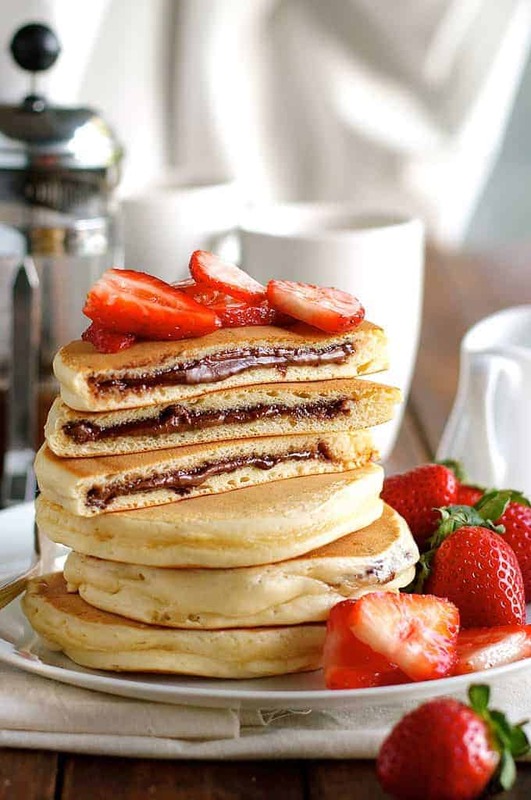 Save these Nutella Pancakes to your “MUST TRY” Pinterest Board! 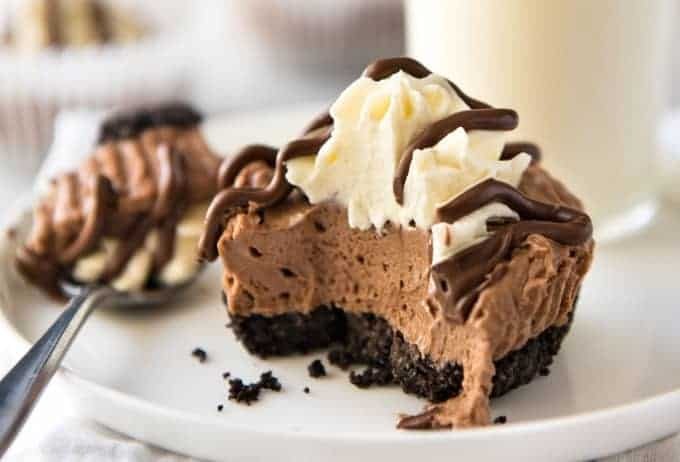 If you are as obsessed with Nutella as I am, you will LOVE these No Bake Mini Nutella Cheesecakes! 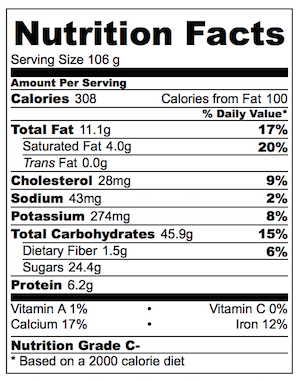 They’re made in a muffin tin! I made this today and my son loved it we both can’t stop eating it 😍 thank you for the yummy bfast recipe tina ❤ more power to you! Thank you!!! I was happy that finally I made fluffy pancakes from scratch–for the first time! Can you freeze the finished product and reheat? Hi! Mine turned out so perfect! But we all found the smell of egg too distinct! I also added vanilla. Can we make these without egg? Made this today. Very good – I was surprised to see how much less than I expected on the bottom, and much more than I expected on the top was needed. I couldn’t get mine as round and perfect as yours in the picture but that didn’t stop them from being fantastic. Great Recipe.